When Melanie Wilkerson enrolled at The Soma Institute, in May of 2014, she was 42 years-old. She had spent the bulk of her adult life, at that point, working in hospitality and was ready for a change. As fate would have it, she was scrolling through Facebook when she happened upon a post made by someone looking thire a licensed massage therapist. Melanie had always had an interest in massage and began to look into schools in order to pursue this interest. Fast-forward one year later and Melanie is graduating from Soma, and has been placed on the President's Honors List. 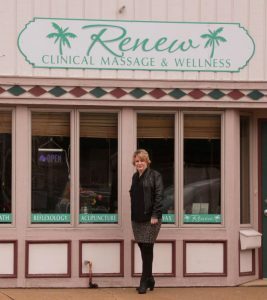 Move ahead one more year and Melanie is opening her own business, Renew Clinical Massage and Reflexology. Today, Melanie is still running her office where she has even been able to hire some fellow Soma Alumni. She loves being her own boss and being able to create the sort of work environment that is meaningful to her. If you ask her how she was able to create her own successful business so quickly, she will cite the entrepreneurial mentality she has had as long as she can remember. She will also reference the disciplined, hard-working approach she brought to her study of clinical massage therapy both inside and outside the classroom. Giving free massages during her formal education was important, not just for her to build a clientele, but also for practicing the principles she was learning at school. Finally, not to be overlooked is her time at Soma. For Melanie, the clinical perspective that is the cornerstone of The Soma Institute's approach to massage therapy is especially important, even in a spa setting. The in depth clinical knowledge she gained from Soma has allowed her to meet not just her client's wants, but also their needs. The support she received from her instructors was also highly influential. She took the initiative to reach out to faculty and ask questions about what she was encountering in her free massages, and they were more than happy to answer these questions and help make connections to things learned in the classroom. As a result of her tenacious approach to her own growth as a therapist, and the guidance of Soma's faculty and curriculum, Melanie was able to leave school with the tools necessary to provide clients with exceptional treatment, build her brand, and become her own boss.